According to the police, around 10.30 pm on Sunday the iron scaffolding, erected to support labourers working at the under-construction building site, collapsed on an autorickshaw, injuring both the driver and the passenger, besides another pedestrian. One person died and two others sustained injuries after the scaffolding of an under-construction building near Dharavi bus depot collapsed late on Sunday night, police said. As the three victims were rushed to the nearby Sion Hospital, the rickshaw driver, identified as Shahdad Alil Ansari (32), was declared dead on arrival. The other two persons – Shamlal Jaiswal (60) and Sajid Khan (33) – who suffered head injuries were admitted to the emergency ward. On Monday, doctors said the condition of the two victims was stable. 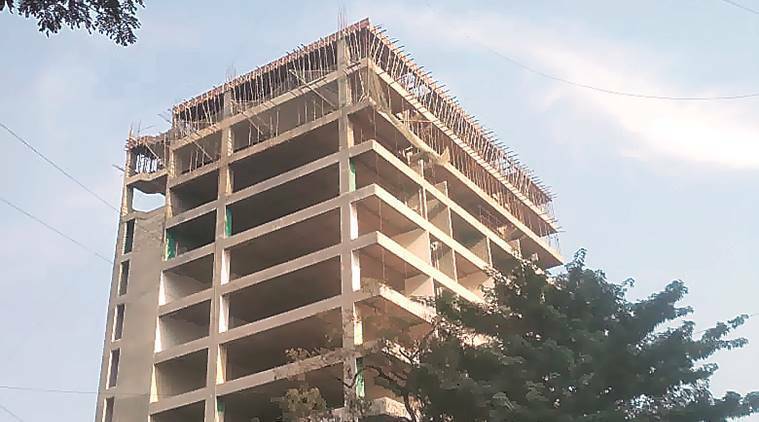 The under-construction building belongs to MHADA (Maharashtra Housing and Area Development Authority), police said. The scaffolding, police added, was installed on a 21st storey of the building and had collapsed as it got loosened due to winds. “We have registered a case under section 304 (A) (causing death by negligence) and 338 (causing grievous hurt by act endangering life or personal safety of others) of the Indian Penal Code on the complaint of one Shamsher Ansari,” an officer from Dharavi police station said. The police are yet to make any arrest in the case. In another incident, three persons were injured after a slab collapsed on them at Nagapada on Monday afternoon. All the three injured – Tajubul Shaikh (23),Abhimanyu Roy (32) and Hamjabin Allabin (28) – were taken to JJ Hospital and are stated to be stable.